You will board the 5* Sapphire Princess in Southampton. She departs into the English Channel and on to the North Sea. Norway’s fourth largest city, Stavanger lies at the mouth of the Gandsfjord. The old port, attests to the sea’s enduring role in Norwegian history. Here, Vikings once sailed on voyages of conquest and exploration. In later centuries, the port served as a major hub for Norway’s mercantile and fishing fleets. By the mid-20th century, however, Stavanger had fallen on hard times as the fishing grounds dwindled. In 1969, the discovery of North Sea oil opened a new chapter in Stavanger’s history. At the “Sword in the Rock” Monument, three giant crossed Viking swords commemorate King Harald Fair Hair’s unification of Norway in 872 following his victory at the Battle of Hafrsfjord. Lying at the head of Aurlandsfjord, this small village of some 400 people is surrounded by snowcapped mountains, isolated farmsteads and waterfalls. Flåm also boasts the extraordinary Flåms Railway. One of the most dramatic train rides in Europe, the Flåm Railway takes an hour to cover 10 miles, hugging cliffs, plunging through tunnels and pausing for its passengers to admire the views as it ascends the Flåm Valley to Myrdal, a desolate mountain plateau. Completed in 2000, the 16-mile-long Aurland-Lærdal Tunnel is the world’s longest traffic tunnel. It burrows beneath the mountains connecting Flåm and Lærdal on the Sognefjord. Hellesylt is your gateway to the scenic wonders of the Geirangerfjord district. Traveling overland from this old Viking port, the traveler can visit Jostedalsbreen National Park, home to Norway’s last remnant of the Ice Age. Trek to Briksdal Glacier, and look at its massive beard of ice. The dramatic landscape also offers stunning vistas of mountains, waterfalls, and fast-flowing rivers teeming with salmon. At over 4000 feet above sea level, the summit of Mt. Dalsnibba offers dramatic views that stretch from Jostedalsbreen National Park to the waters of Geirangerfjord. Note: Hellesylt is a cruise-by port. 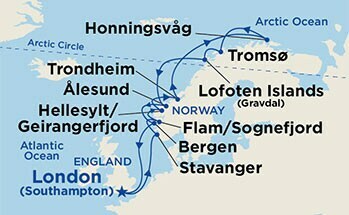 Only those passengers participating in Hellesylt tours will transfer to shore by ship’s tender. Like the spear it’s named for, Geirangerfjord thrusts nine miles into Norway’s mountains. Over 900 feet deep, the narrow fjord is lined by sheer cliffs that rear some 2,000 feet above its surface. Waterfalls, such as the Seven Sisters and Bridal Veil Falls, plummet from cliff to fjord. At the head of this magnificent spectacle sits the tiny village of Geiranger. No wonder travelers have come to call for over a century and a half. Note: Geiranger is an anchorage port – passengers transfer to shore by ship’s tender. Trondheim is the third largest – and second oldest – city in Norway. The town was originally called Kaupangen upon its founding in 997 A.D. by Viking king Olav Tryggvason. The city commands the trade routes linking Southern Norway with the fjord lands to the north. Trondheim quickly became a major commercial and cultural center – the city served as Norway’s royal capital. Trondheim’s old city features broad avenues and attractive 17th-century wood buildings – a legacy of the rebuilding that followed a disastrous fire that leveled the city in 1681. Honningsvag is your gateway to Norway’s North Cape on Magerøya Island. This is the northernmost point in Europe, and the true land of the midnight sun. From mid-May to July, the full disc of the sun never dips below the horizon. In winter, the days barely lighten to a spectral gloom. To the north lies only the remote Svalbard Archipelago, Jan Mayan Island, and the polar ice cap. From the cliffs of North Cape, perched 1,000 feet above the Arctic Ocean, one stares into the arctic silence. During the summer months, vast reindeer herds roam Magerøya Island’s treeless, central plateau. Gravdal is one of the largest villages in Vestvågøy and part of the Lofoten Archipelago in northern Norway. Gravdal serves as your gateway to the Lofoten Islands, the western remnants of great mountains that were worn away by glaciers. Lying entirely above the Arctic Circle, the islands’ dramatic natural architecture of rocky peaks along with picturesque villages places this archipelago in a league of its own. The island of Giske is the reputed birthplace of the great Viking Rollo, who laid siege to Paris and founded the Duchy of Normandy. William the Conqueror was his grandson. In 1904, a massive fire destroyed 800 buildings in this fishing port. Germany’s Kaiser Wilhelm II responded with immediate aid, and Ålesund was reborn. Not surprisingly, the town was rebuilt in the then-popular Art Nouveau style known as Jugendstil. The result is one of the prettiest ports in Norway. Buildings with elegant turrets and spires can be seen lining the streets of the city center. Today, the city is one of Norway’s most important fishing harbors and the world’s largest supplier of stockfish (Klippfisk) – dried cod. Alesund’s major attractions are the surrounding fjords and the stunning Sunnmøre Alps. Bergen has played a crucial role in Norwegian history and culture since Olav the Good founded the city in 1070. Perched between the sea and seven hills, Bergen has witnessed Vikings setting sail on voyages of exploration, trade and war. In the Middle Ages, its old port was a major trading hub for the Hanseatic League, the band of Germanic merchants whose trading empire encircled the Baltic and North Seas. In the 19th century, Bergen was home to such cultural luminaries as the virtuoso violinist Ole Bull and the composer Edvard Grieg. The city retains much of its 18th- and 19th-century charm. Visitors to Bergen will encounter a city that offers a heady blend of natural beauty, history and culture. Your cruise comes to an end in Southampton.